The Residential Development Bond – An investment built on solid foundations. Find out more about the 7% fixed rate return bond. The Residential Development Bond is an unlisted security and is not regulated. Capital is at risk. Investors can lose some or all of their total investment. Oxford Capital is unable to offer financial or tax advice and this blog should not be construed as such advice. Why choose the Oxford Capital Residential Development Bond? The Manager: Oxford Capital have arranged over £50m of loan facilities within OCEPS, across more than 50 loans. The underlying asset: Many people like to invest in a tangible asset, like housing. The feel good factor: Many also like to invest in people. It is reassuring to know that an investment in housing will support young families in their first homes, middle-aged ones with expanding needs, or older people as they downsize. The alternative: You avoid the fading attractiveness of buy-to-let investments. You have none of the hassle of dealing with letting agencies; no insurance and other costs to worry about; and no repair and maintenance headaches to sort out. The need: Finally, your investment is directed at a government-recognised priority. House building is at record lows and demand for housing is growing. Developing more housing is now a government commitment. 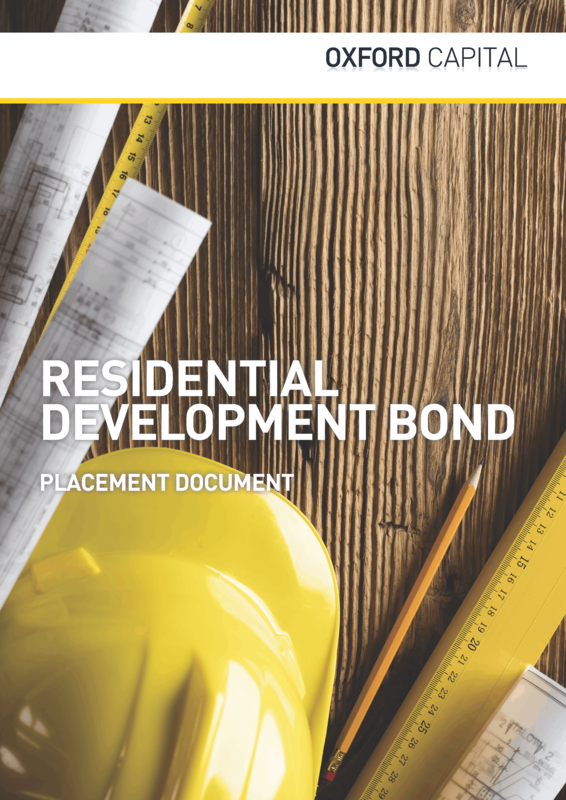 The details – What is the Residential Development Bond? How does it work? Investment process – So that you draw on our all-round expertise, the Bonds are issued by a company that is managed solely by us, as part of Oxford Capital’s Estate Planning Service (OCEPS). The company provides loan finance to highly experienced UK housebuilders, who in turn build quality homes, of varying types, for UK homeowners. Returns on your capital – Returns are generated by the interest and fees on these loans – not by direct investment in the housing, nor from owning it. Investment details – 12 months bond. 7% per annum coupon*. Minimum investment of £10,000 (Tranche A). NOTE: The bond issue is limited to 50% of the value of the underlying loan commitments held by the issuer, at the time the bonds are subscribed for by investors. 3 Security arrangements – Loans are made subject to taking security over all of the assets of the development project, from the underlying land to all of the construction work and materials on the site. As a Co-investment, Bondholders will benefit from Security held by a security trustee on a ‘Pari Passu’ basis with certain Oxford Capital managed entities. Thirdly, the Bond Issuer, in its role as Lender, is the first recipient of funds to be repaid from the sale of completed housing units. *The coupon and the term of the bond are not guaranteed.